Join us . . . holiday fun for all ages! Watch our Holiday Dance Show & have fun supporting the arts in our local community. All proceeds will go towards the DDANW Non-Profit mission for developing young artists in our community & providing performance opportunities. Additional tickets are $24 each. 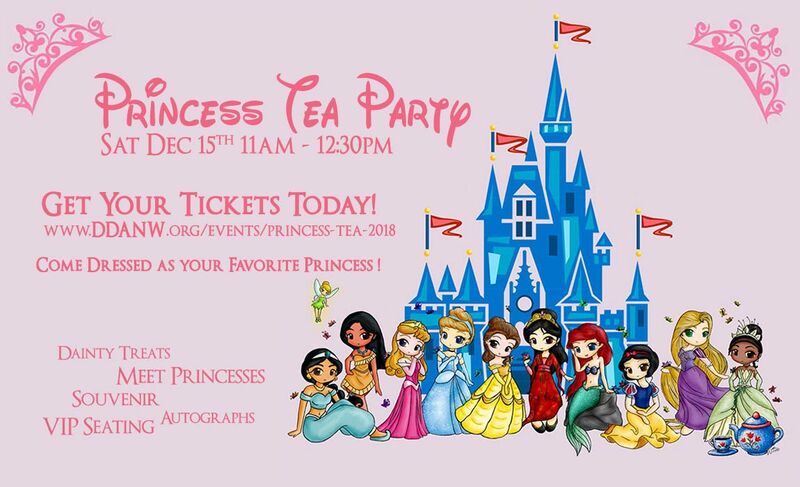 Come Dressed as your favorite Princess! Includes: VIP Show Seating (for 1pm matinee), Dainty Treats, Visit from princesses, Souvenir, Autographs, Royal Tea Time, Princess Performance, & more. Treats Disclaimer: We will not accommodate to any food allergies. Photo Disclaimer: Photographs will be taken at our Princess Tea Party & may be used for future promotional material. If you do not want pictures taken of your child, please let our staff know. Tickets are available to purchase at the door. Be sure to arrive early!! NOTE: Online Ticket Sales have ended. You'll need extra time to purchase tickets at the door & make your way to your seat before the show begins (& auditorium doors close).